Due to lower soybean prices and higher costs, budgets suggest returns will be very low for corn and soybeans in 2019. Conserving cash, cutting investments, reducing costs, and renegotiating cash rents should be aggressively pursued. If prices do not increase, the budgets indicate it is unlikely that farmers will be able to generate profits on rented farmland in 2019. Each year, the University of Illinois releases crop budgets for three regions of Illinois: northern, central, and southern Illinois. Central Illinois is further divided into categories for high and low productivity farmland. A complete set of budgets is available in the management section of farmdoc. All of these budgets are based on historical returns and costs from grain farms enrolled in Illinois Farm Business Farm Management Association (FBFM) program. 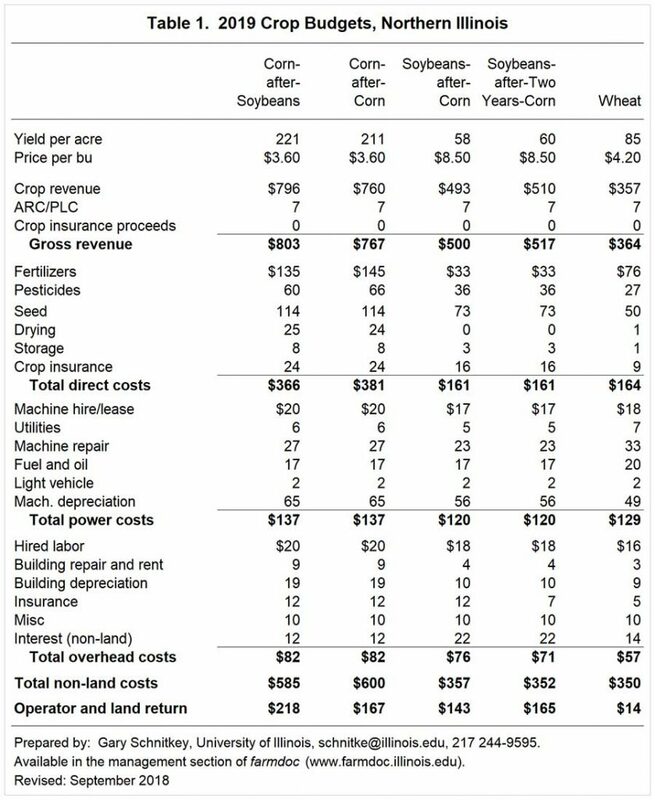 Summaries of previous years' results are shown in Revenue and Costs for Illinois Grain Crops which is available for download in the management section of farmdoc. For each region, budgets are shown for corn-after-soybeans, corn-after-corn, soybeans-after-corn, and soybean-after-two-years-corn, and wheat. Central and southern Illinois budgets also include double-crop soybeans. Discussions will focus on the northern Illinois budgets shown in Table 1. The other regional budgets are shown in tables following the text. Northern Illinois yields are 209 bushels per acre for corn-after-soybeans and 58 bushels per acre of soybeans-after-corn. These yields are trend yields for northern Illinois and are below the average yields for the last t,hree years. Yields have been exceptional in Illinois for the past several years (see farmdoc daily, September 5, 2018). From 2016 to 2018, yields averaged 221 bushels per acre for corn and 63 bushels per acre for soybeans. Rather than building budgets with continuing exceptional yields, a longer-term trendline provides a more prudent prediction based on historical yields. Prices used in budgets are $3.60 per bushel for corn and $8.50 per bushel for soybeans, close to current bids for 2019 grain. The $3.60 corn price is near the average price received in the past three years. On the other hand, soybean prices are much lower. Soybean prices averaged $9.18 in 2016, $9.66 in 2016, and $9.85 in 2017. Much lower soybean prices result in lower projections for soybean returns. The budgets include $7 per acre of ARC/PLC payments. These payments are based on corn prices being below the $3.70 reference price, thereby generating Price Loss Coverage (PLC) payments. These payments assumes that a new farm bill or extension of the 2018 Farm Bill is passed, that the passed legislation allows the choice between Agricultural Risk Coverage (ARC) and PLC, and that most farmers choose PLC for corn. This $7 per acre estimated payment is applied to both corn and soybean acres as commodity title program payments are made on base acres, and not on planted acres. 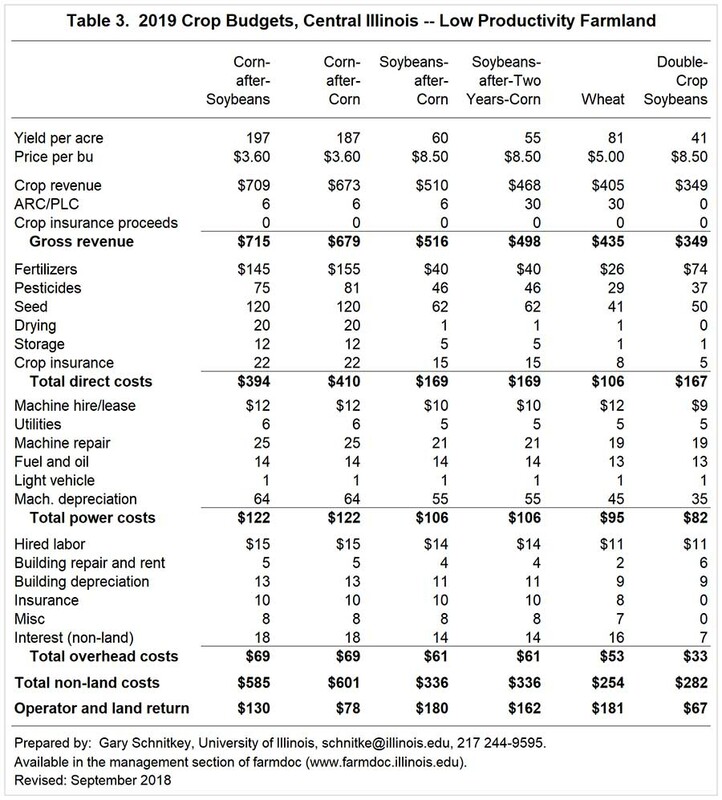 Revenue totals $759 per acre for corn-after-soybeans and $500 per acre for soybeans-after-corn. Non-land costs are projected at $585 per acre for corn-after-soybeans and $357 per acre for soybeans-after-corn. Rising energy prices are leading to increases in some farm level costs (see farmdoc daily, June 21, 2018). Major cost items with increases include fertilizer, pesticides, fuel and oil. Also, interest costs are increasing due to higher interest rates. Operator and farmland returns are projected at $174 per acre for corn-after-soybeans and $143 per acre for soybeans-after-corn. For the first time since 2013, corn is projected to be more profitable than soybeans (see Figure 1), potentially leading to more corn planting in 2019. Land charges need to be subtracted from operator and land returns to arrive at a return to the farmer. If farmland is cash rented, the cash rent must be below the operator and land return for the farmer to have positive returns. 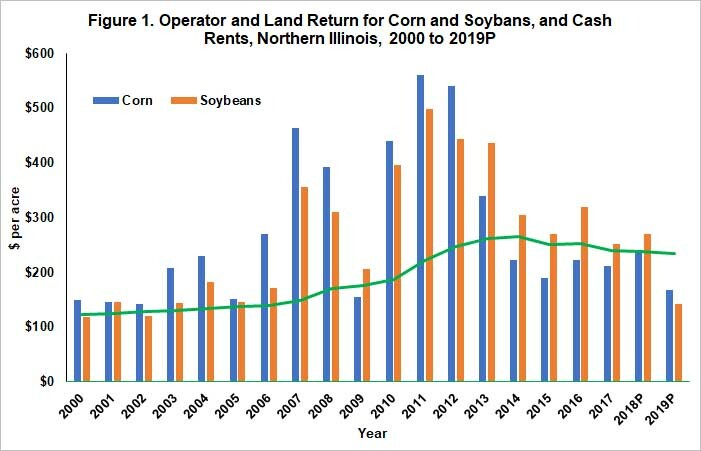 In 2018, cash rents in northern Illinois averaged $238 per acre, well above the 2019 operator and land return projections of $174 per acre for corn-after-soybeans and $143 per acre for soybeans-after-corn. Projected returns for 2019 are very low. This return level is similar to return levels in 2005, more than ten years ago (see Figure 1). In 2005, average cash rent in northern Illinois was $137 per acre, $101 per acre lower than current cash rent levels. Obviously, the fall of 2019 is far away and much can change. Higher prices would considerably help improve the outlook. Whether prices will rise is an open question, likely depending on whether tariff disputes are resolved. Without price increases, however, returns will be low. Even continued exceptional yields, like those in recent years, would still result in losses. For example, a 221 bushel per acre corn-after-soybean yield - the last-three year average - would result in an operator and land return of $218 per acre, still below the $238 per acre average cash rent. While there is hope for a brightened outlook, current budgets indicate losses on rented land in 2019. Incomes in 2018 could be reasonable given exceptional yields and Market Facilitation Program payments (see farmdoc daily, September 11, 2018). Actively conserving cash from 2018 operations while cutting capital investments and other costs where possible seems prudent. Consider all possible options for lowering cash rents and moving to variable cash rents. Even given these measures, it seems unlikely that enough costs will be cut for farmers to have positive returns on rented farmland in 2018 without substantial positive movement in commodity prices. Extreme caution seems the order of the day moving into 2019. Again, prices hopefully will improve thereby brightening a bleak situation.